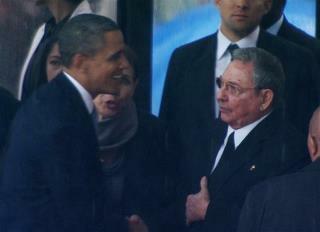 Is the Obama-Castro Handshake a Big Deal? (Newser) – At Nelson Mandela's memorial, President Obama shook hands with the Cuban president, and the media is in a tizzy about it. "The handshake between Obama and Raúl Castro makes the stomach turn," writes Mona Charen at the National Review. "The nature of the Cuban regime should be enough to cause our president to find some way to avoid a handshake." At Breitbart, Frances Martel lists activists in Cuba "whose plight President Obama willfully ignores and whose oppression he embraces as he embraces their oppressor." I was a child when the "Bay of Pigs" happened. I remember the drills to get ready for a nuclear attack. Gads I feel old. Yea I STILL hate Castro Sorry. It isn't the media in a tiz just the right wing noise machine.